If you need your particles or points to be rendered with constant size according to your camera, in Houdini, this is what you could do. Add a UV Texture SOP. Change texture type to Perspective from Camera. Change attribute class to Point. Add a Point Wrangle SOP. We want the scale of the particles to be connected to the distance of the camera. This is the @uv.z. We want also to control the overall size of the particles, so we add a control multiplier. In the /obj, be sure to check that Render Unconnected Points or Render Only Points are active. Here you can also control the size of the particles again. If you don’t want the particles to be rendered as Spheres, select Circles. Points, vertexex, primitives. Vertexes are part of a primitive. Points are the lowest level attribute of any data type you can have. Like weight, null, nurbs. You can have a primitive in one point, for example. A point is where Houdini stores all the informations about something. Makes sense. You move your camera in your viewport with your spacebar pressed. Set Driver / Set Driven in Houdini: to parent the position or whatever of one object to another, highlight the attribute, right click Copy parameter. On the second object Paste Copied Relative References. To see the expression, click on the attribute name. It will cycle between the value and the expression. Dark green on the values means that there’s an expression beneath. .. means going back one level, inside the same network, to the circle1, to the position x.
you can see that tx means translate hovering the mouse on position. You can get all the parameters names just hovering the mouse with ctrl pressed. The expression is saying: I need to pull a channel from a node that it’s not myself, that is called circle1 and the value is tx. We can change the values of our expressions as well. If we hover the mouse on the value we added, we can use the value ladder clicking the MMB. Resample: use it to generate tangent, curve, ptdist, curvenum. CurveU goes from 0 to 1, from the beginning of the curve, to its end. */f@myattrib = 1.0; // f means floating point. This line means that I’m creating a new variable, called myattrib, it’s a floating number and it’s 1.
fit() take a number between 2 values, fit it between 2 other values, usually 0-1.
rand() generate a random number between 0 and 1.
sin(), cos() as you’d expect, but in radians. You can download the Houdini project here. I had a bit of fun with Point VOPs, nothing crazy. Following this tutorial that creates trails from volumes. Playing with some splines. 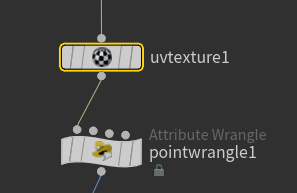 In Houdini you create them with the Curves sop. 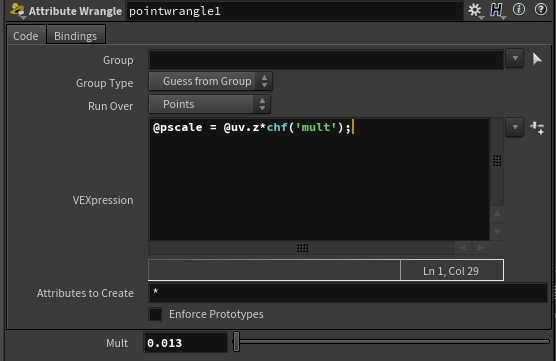 Polyframe to generate tangents from points. Press X to create a Visualize node. Just be careful when declaring the type of variable. A tangent is a vector, not a float. , each voxel holds just one value. , each voxel holds three values. , each voxel holds nine values. If you want to use the tangents in your Volume, you have to use a Vector rank. Careful about Name parameter of Volume sop. It’s not “just a name”. It’s absolutely important. Naming volumes allows mantra and the Volume VOP to override the correct parameters with the values of the volume. The input of the Volume sop is Bounding Source. It’s the Bounding Source of the geometry! When you create a Volume it will look at the boundary box of your object. If you want to increase the Volume boundary box, use a Bound sop, not a Volume Bound! Volume Vop allows us to write vex for volumes. When you’re working with vector, remember to change Bind export to vector! These are Vops that I used in the Volume Vop. Point Cloud Open: this node opens a point cloud file and searches for points around a source position. Pount Cloud Filter: allows us to choose an attribute (channel) from the point cloud. Length: it calculates the lenght of a vector. Volume Trail sop: computes a trail of points through a velocity volume (from the help!). 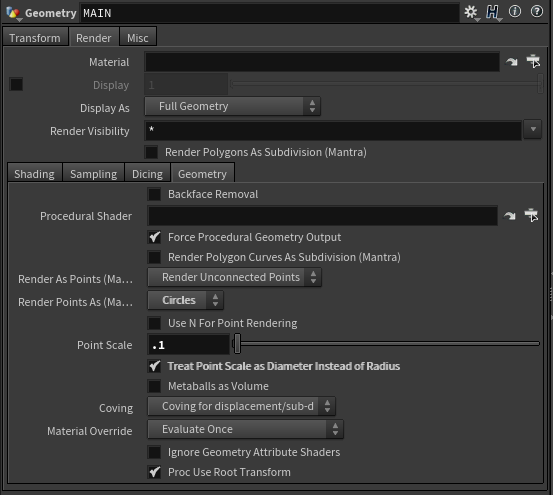 Remember: VDB from Polygon to create a volume from polygons. VEX stands for Vector Expressions. SHIFT + R to reverse the node inputs. The full list of VEX functions is here. f@myattrib = 1.0; // f means floating point. This line means that I'm creating a new variable, called myattrib, it's a floating number and it's 1. In the past few days I’ve jumped between tutorials and, to be honest, the more I watch them, the more I understand. The last one I’ve done is just brilliant, about reaction diffusion, by Entagma. And, finally, I’ve been able to render an animation! So, I’ve just finished the first big tutorial on Digital Tutors. But before I start on those, I’ll dive into Dynamics a bit more with another Digital Tutors tutorial. If some penetrations happen, check the cloth thickness in collisions. The main controls for the Cloth are in Model, like C4D: stiffness, damping, density. Stiffness: how much cloth is resisting deformations. Density: how heavy is the cloth?